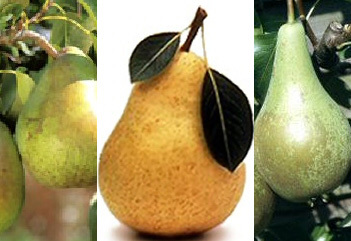 Buy Family pear trees for sale online FREE DELIVERY from UK suppliers of garden fruit trees. An unusual idea. Family pear trees offer the possibility that on each pear tree there will be fruit from three different pears. With this tree you have Conference, Comice and Williams. The different varieties are simply grafted onto the rootstock forming a bit of a Frankenstein tree (in the best possible way of course!). Another benefit is that the three varieties act as pollination partners to one another. All family pear trees only come in 12L containers as a bush on Quince A rootstock which means they will grow to around 3.6 metres in height.